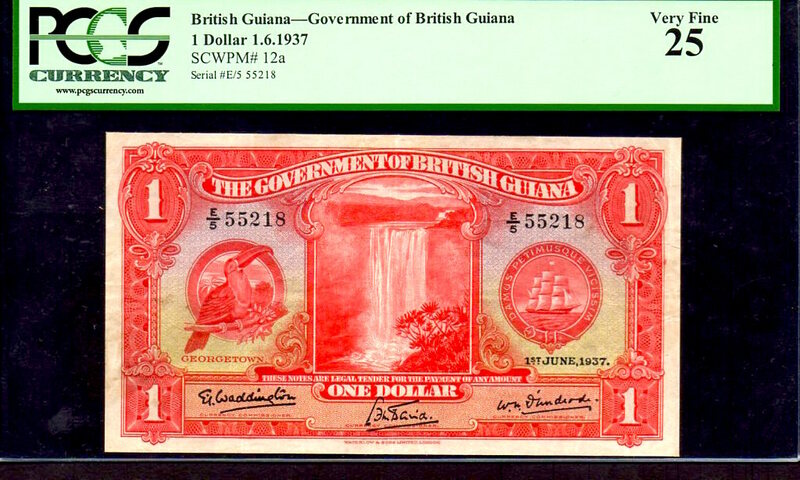 BRITISH GUIANA P12b $1 1.10.1938 "TOUCAN BIRD" CGC 67PQ FINEST KNOWN - BY ALL GRADING CO'S! ALSO GRADED SAME Pmg NOT ONLY IS THIS NOTE THE FINEST KNOWN, BUT IT'S "THE" ONLY UNC EVER DISCOVERED! WE ALSO HAVE THE ELUSIVE $5 "TOUCAN BIRD" IN OUR EBAY STORE, ALSO A FINEST KNOWN AND EXTREMELY RARE!!! 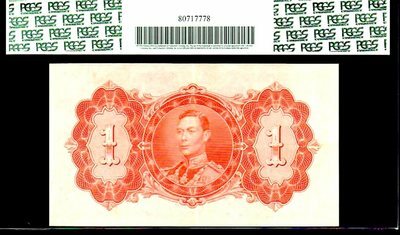 A VERY POPULAR NOTE SET WITH COLLECTORS! 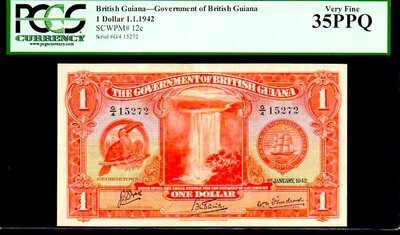 BRITISH GUIANA P12c $1 1.1.1942 "TOUCAN BIRD" PMG 55 2ND FINEST KNOWN - BY ALL GRADING CO'S! 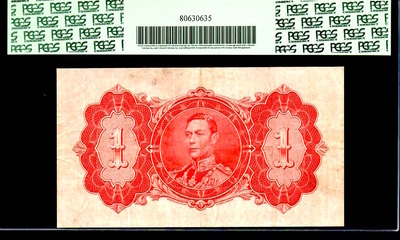 GORGEOUS VIBRANT COLORS AND VERY WELL BALANCED MARGINS! 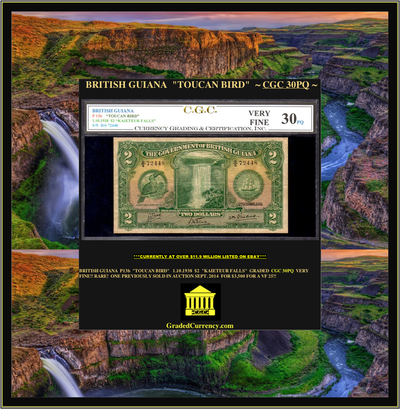 WE ALSO HAVE THE ELUSIVE $2 & $5 "TOUCAN BIRD" IN OUR EBAY STORE, ALSO A FINEST KNOWN AND EXTREMELY RARE!!! A VERY POPULAR NOTE SET WITH COLLECTORS! 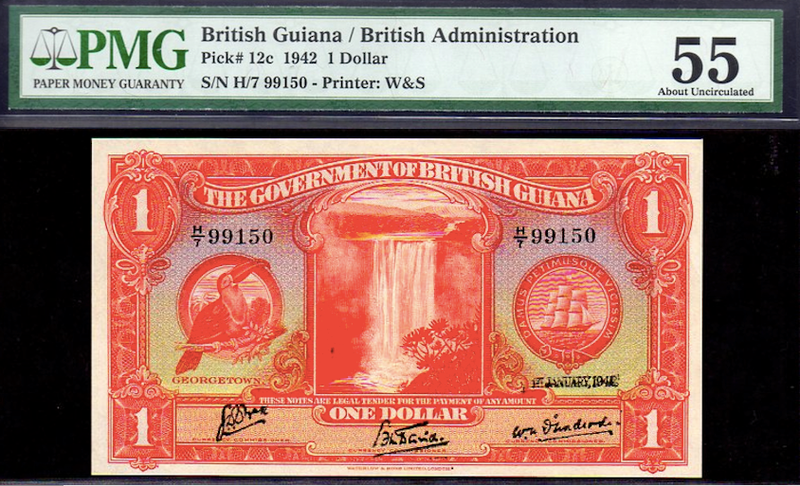 BRITISH GUIANA P12a "TOUCAN BIRD" 1.6.1937 $1 "KING GEORGE VIth" GRADED PCGS 25 VERY FINE!! ONLY 5 OTHERS GRADED BY ALL GRADING COMPANIES! 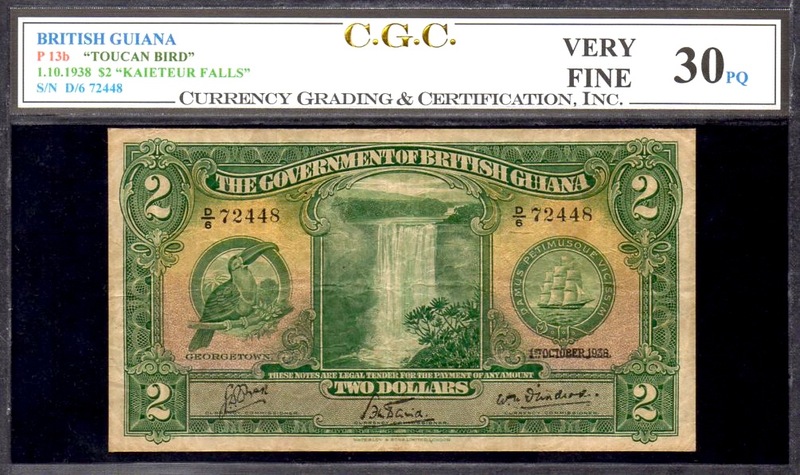 BRITISH GUIANA P13b "TOUCAN BIRD" 1.10.1938 $2 "KAIETEUR FALLS" GRADED CGC 30PQ VERY FINE!! RARE! ONE PREVIOUSLY SOLD IN AUCTION SEPT. 2014 FOR $3,500 FOR A VF 25!! BRITISH GUIANA P13b "TOUCAN" 1938 $2 "KAIETEUR FALLS" GRADED CGC 35 VERY FINE! BRITISH GUIANA P13c $2 1.1.1942 "TOUCAN" CGC 30 "FINEST KNOWN BY ALL GRADING CO'S!" 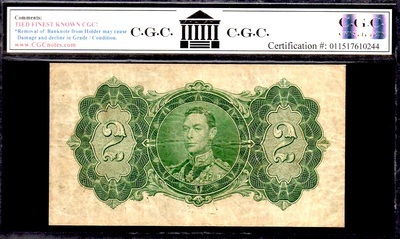 THIS IS INDEED "THE" ONLY PIECE EVER GRADED BY ALL GRADING CO'S! 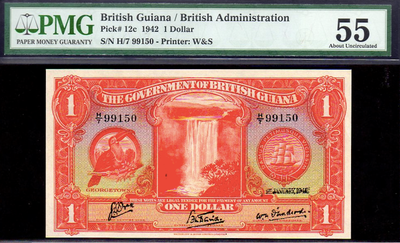 "KAIETEUR FALLS" FEATURED IN CENTER OF OBVERSE (WITH TOUCAN BIRD TO LEFT). 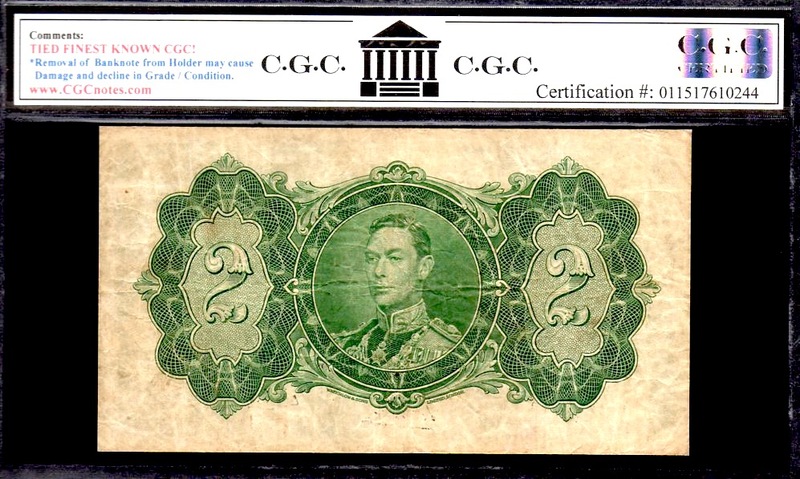 WE ALSO HAVE THE $1 1942 FINEST KNOWN (CGC 67 AND GRADED BY Pmg) AND ALSO THE $5 CGC 45PQ (LOOKS GEM) THAT'S ALSO THE FINEST KNOWN BY ALL GRADING CO'S! 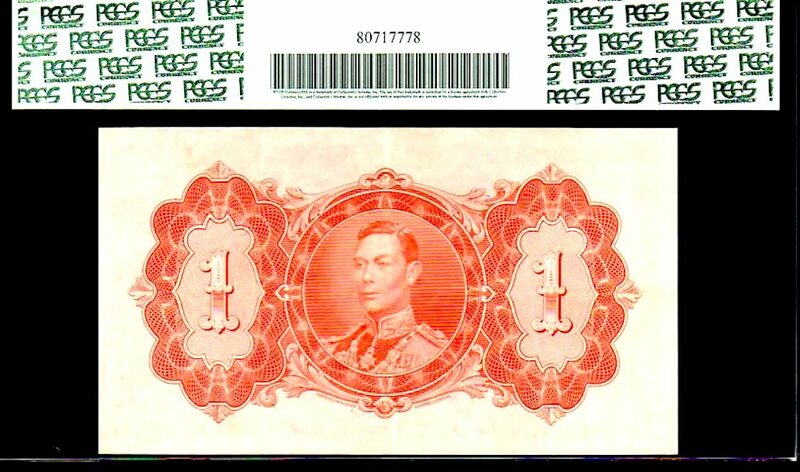 THIS IS A VERY DESIRABLE SET AND RARE, QUITE RARE! 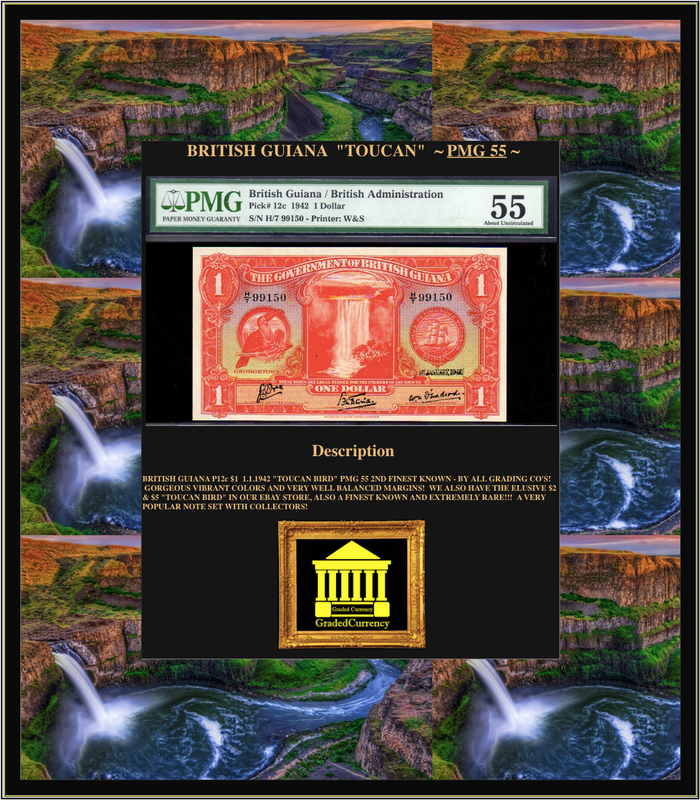 PICK # 14b BRITISH GUIANA "TOUCAN" 1.1.1942 $5 "KING GEORGE VI" 45PQ! ** NOTE: THE RED AT THE TOP OF THE WATERFALL IS "NOT" ON THE NOTE, BUT MERELY A REFLECTION OFF THE PLASTIC BY THE SCANNER *** EXTREMELY RARE FINEST EVER GRADED BY CGC! 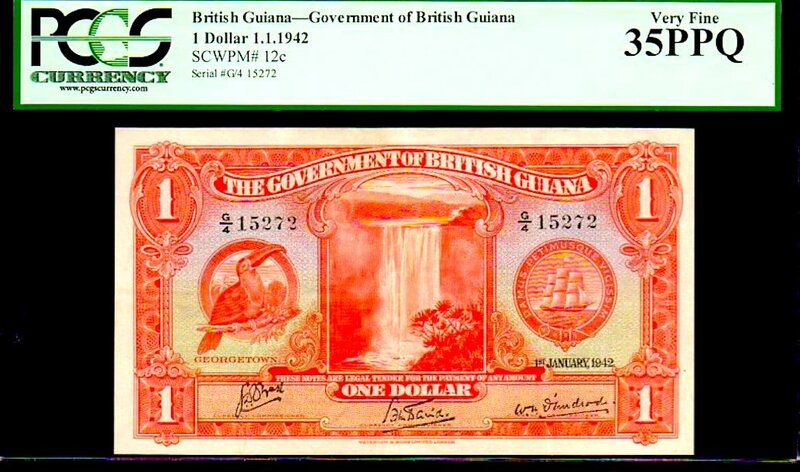 BRITISH GUIANA WAS FIRST SIGHTED BY COLUMBUS IN 1498. THE FIRST EUROPEAN SETTLEMENT WAS MADE LATE IN THE 16TH CENTURY BY THE DUTCH. THIS NOTE IS SO SO SO SPECIAL, ESPECIALLY IN THIS GRADE. I FULLY EXPECT TO NEVER SEE ANOTHER IN THE REMAINDER OF MY LIFETIME! 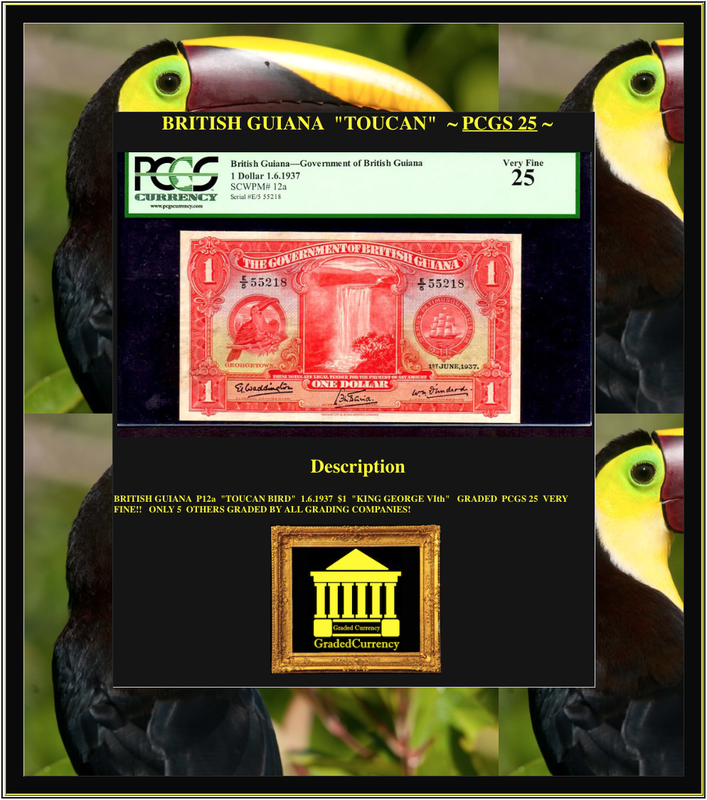 BRITISH GUIANA P14b $1 1.1.1942 "TOUCAN BIRD" CGC 35PQ 2ND FINEST KNOWN - BY ALL GRADING CO'S! GORGEOUS VIBRANT COLORS AND VERY WELL BALANCED MARGINS! 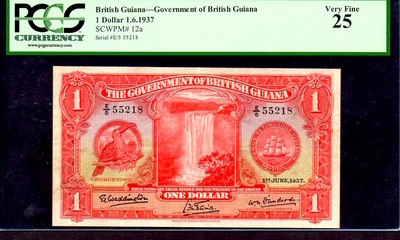 WE ALSO HAVE THE ELUSIVE $2 & $1 "TOUCAN BIRD" IN OUR EBAY STORE, ALSO A FINEST KNOWN AND EXTREMELY RARE!!! 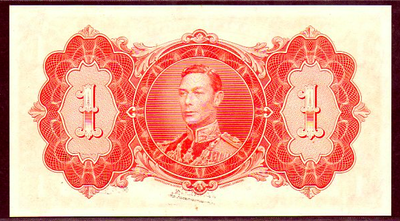 A VERY POPULAR NOTE SET WITH COLLECTORS!